Vivo Gaming is another Live Casino Software provider that is dedicated to developing live casino software and solutions for the online gaming market. They also have solutions that enable land-based casinos to extend the availability of their games within the resort, making it possible for players to access the tables over Wifi. The company is privately owned and has about 200 employees. It has offices in Miami, Florida where the development and management staff are located, Lithuania & Costa Rica that house more development teams and in Israel, where the marketing and sales teams are located. They have an impressive menu of live casino games, although, at the time of writing this article two of them, Caribbean Poker and Craps are not available, although there are plans to have them re-instated. Vivo Gaming clearly has the ability to offer customers what they want and have an impressive array of products and services. They have collaborations in place with software aggregators like EveryMartix so their games can be provided as part of a package. Customers have the option of using shared tables from Vivo’s live casino studios that are based in Central America, Europe and Asia. Options exist to have dedicated tables in dedicated or shared studios where the client can personalise and brand equipment, dealers and games to suit their customer’s needs. Unfortunately for me, Vivo Gaming does not hold a UK License so I’ve not been able to test their software using real money. I have however used their demo system. You get fun money but you’re playing at real tables alongside real money players. You’ll get a good flavour for the games and the dealers this way. Good news is that I have found a casino that has Vivo Gaming Live Games and a load of other software providers, so I’ve been able to play at the others so can testify that the casino is safe. Baccarat 1 – 200 None To see the latest Live Casino promotions. Click Here. Baccarat 1 – 1250 mBTC None To see the latest Live Casino promotions. Click Here. 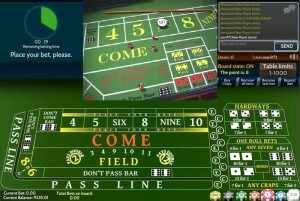 Multiple table games – The ability to play multiple tables in one browser. 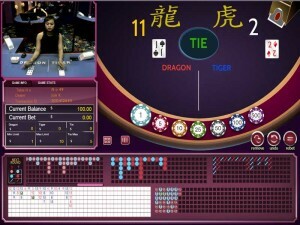 Multiple player interfaces – Sit at tables with other players, see what they bet and how they play their hands. Multi Lingual and multi currency – Options for specific language and currencies. Mini casino games – non live games like Slots & Video Poker that can be played from the same browser window. 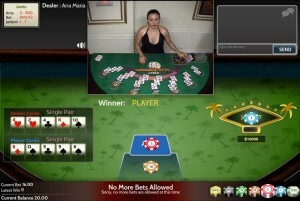 Chat – Ability to chat with the dealer and / or other players at the tables. No software download is needed – In browser play. Mobile – Full HTML5 mobile live casino. Roulette and Baccarat with Baccarat Squeeze. Blackjack to be added May 2016. Side bets – Sides bets for Blackjack and Baccarat. 24 x 7 operation – tables open around the clock. Two Casino studios to pick from, Asian & Caribbean. These descriptions are for the general play tables and games. Dedicated tables and game variations are possible. This is the European version of the game with a single zero. French bets can be placed using the racetrack feature. Previous results history is displayed in an easy to read window in the playing interface. Camera closeups are provided of the results and of the wheel when it’s spinning. A range of Baccarat games are on offer, currently 8 different versions are available to some customers.! Single and multi player games are available. Seven seat blackjack with Vegas Rules. Split hands up to twice. Play multiple seats (up to 3). One card dealt to Dragon and Tiger. Baccarat Roads and hand histories and stats displayed. Not currently operational, but likely to be re-instated from their studio in Uruguay. Not currently operational. Was withdrawn due to a lack of demand, but they are hoping to open a table as there is demand from the US. As a company Vivo Gaming are clearly making efforts to develop their products and enter new markets. They are the only supplier of a Live Craps solution and whilst it’s not currently operational it’s there waiting to be exploited. The software is very easy to use, in fact I keep looking for configuration options, but there aren’t any to change. The standard settings work just fine. Personally I’d like to see the confirm bet button removed or made optional as it’s irritating having to press it each time I place a bet. The lobby is nice and big and choosing games is easy. The background sound in the studio is a bit noisy, but you can alter the volume for each game. The dealers are chatty, but being based in the UK I do find the accents quite heavy, so understanding what is said can be difficult at times. I like that the dealers speak in English and Spanish at the tables I’ve played at. I’m looking forward to the enhancements and I think you’ll see more installations spring up across more Live Casinos as the product develops further. I’m hoping that their plans for a UK license comes because I’ll look forward to playing for real. If you’re interested you can read some of my interviews with Live Dealers from Vivo.